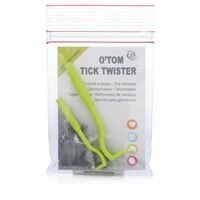 The O'Tom Tick Twister Remover Hooks enable painless, quick, and complete removal of ticks from your animal's skin. It is easier to use than tick tweezers! The tom tick hook allows a painless, quick, and complete removal of ticks from your pets skin. Simply slide the hook around the tick, twirl the hook several times, then pull the hook and tick away from the skin. 2 Tick Hooks - 1 x for small ticks and 1 x for larger ticks. Luckily I've not had to use this, but it has since been recommended to us at dog training by our APDT trainer/behaviourist. It removes the tick without leaving the tick's head still in your dog. Be sure not to squeeze the tick's body, as this can force blood which may now harbour Lyme's disease, back into your dog. A must have for any furry pet owner, very easy to use, cleanly removing the whole tick without leaving the head in, and the two different sizes make it that much easier to deal with the smaller ticks as well as the large ones. Brilliant and simple product. I've bought a few to keep in the car, house etc. Remove ticks simply and easily so that you don't squeeze them and release any of the contents of the tick into your pet. Definitely recommend! An absolutely brilliant tool. We lived in the Scottish Highlands for 10 years so they have been well tested on our 3 dogs. Very easy to use, slide on the hook, twist round and off they come. The small hook is also very effective at removing any parts of the tick left if it has been partially removed by the dog scratching etc. Bought this product prior to our August holiday in the Highlands of Scotland. So glad I did had to use it five times on our Labrador retriever with no ill effects. Very easy to use and appeared to be painless for our pet. One point that seemed to crop up on other sites was to turn it slowly and anti clockwise, this I did and it removed all the tick easily.